We are hosting a food & toy drive to benefit the homeless Salvation Army families & their children starting December 1st until December 21st. Thanks to the generosity of the Fountain Square restaurant we will be able to host a Christmas Celebration Brunch on 12/22/2012 at 10am for ~ 75 homeless adults and their children who currently live at The Salvation Army transitional shelter. Non-perishable food donations and unwrapped new toys for boys & girls of all ages are greatly appreciated! Please come out to one of the locations listed below and support a family in need this Christmas season. 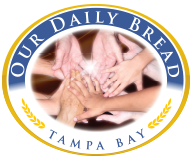 If you would like to volunteer for this event please contact Veturia at veturia@ourdailybreadtampabay.org.